A link to "Turn on Video Description on a Non-X1 TV Box" will be sent via email. Your link to 'Turn on Video Description on a Non-X1 TV Box' has been sent! 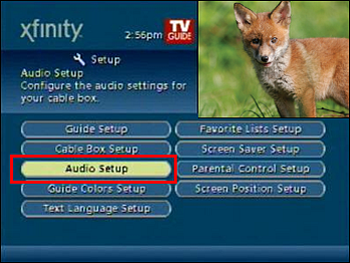 This article provides instructions on how to enable video description by turning on Secondary Audio Programming (SAP) using a TV Box. Note: By default, the D button on an XR2 Remote will enable or disable video description on a non-X1 TV Box in Motorola markets only. Learn more about configuring this button in Motorola markets. Press the Menu button twice on the Xfinity Universal Remote Control. The Menu button is the red oval button located to the right of the center of the remote. Find the right-facing arrow button and move your thumb to the right and then down. If using the XR2 Remote Control, press the xfinity button twice instead of the Menu button. Use the arrow buttons to navigate to Setup in the menu and press OK/Select on the remote. Use the arrow buttons to navigate to Audio Setup and press OK/Select. The Default Audio Track option, Channel Default, is always the channel's main audio track (unless you changed it previously). 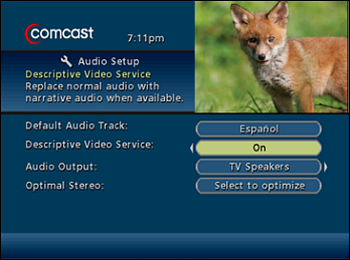 Press the down arrow on your Xfinity Remote once to highlight Descriptive Video Service, then use the right or left arrows to turn it on or off. Note: Video description (Descriptive Video Service) can only be heard if the program provider or cable channel is providing that additional audio option. 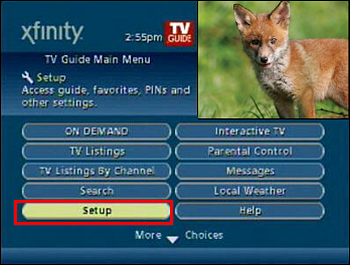 Press the Exit button on the remote (above the Volume button on the Xfinity Universal Remote, and next to the xfinity button on the XR2 Remote) to resume program viewing. Comcast Business TV packages meet your core needs by keeping costs down while including popular cable networks.